In the Bay Area we are fortunate to have a variety of ways of getting around for work, shop, and play. Recently, BART and bicycling (including bike-sharing) have received a lot of attention but there’s a glorious buffet of transportation options out there. One of the fastest growing options is car-sharing. Car-sharing is a convenient and easy way to save (or make) some money while reducing your carbon footprint. 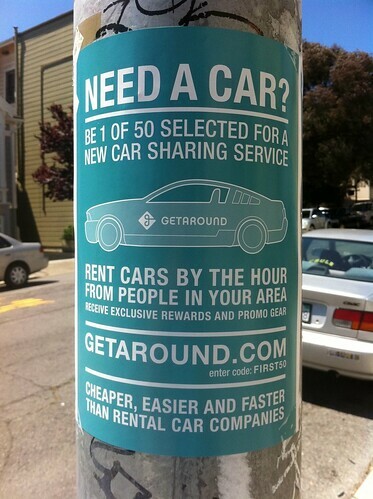 Here’s a sampling of the car-sharing section of the transportation buffet in the Bay Area. Then there are peer-to-peer ride-share and carpooling services, such as Lyft and Sidecar, in which you pull out your phone and within minutes someone comes picks you up in their car. This service is better suited for short and perhaps spontaneous trips across town. This type of service is currently focused in San Francisco, which can still be convenient if you commute into the city and need a ride to the other side of town. The Contra Costa Transportation Authority (CCTA) is currently partnering with Sonoma County Transportation Authority (SCTA) and Transportation Authority of Marin (TAM) to pilot a similar app called “Real-Time Ridesharing” or RTR. One of the latest car-sharing services to hit the streets of the Bay Area is Flightcar, and it is specifically tailored to airport travel. If you have a car and are driving to SFO, you can leave it with a Flightcar attendant and they will allow other people to use your car while you are gone. Alternatively, if you are coming into SFO (or have guests flying in) – they can rent someone else’s car seamlessly, and safely, via Flightcar. Head over to Flightcar and get the details. Similar services such as Airbnb, which allow you to rent a room in someone’s house or list a room in your home for short-term rental, peer-to-peer car-sharing is just one more way we can all share our existing resources and make getting around easier. It may seem like there is an air of mystery with these kinds of shared services but once you try them you quickly find out they are quite reliable, and predictable. Many peer-to-peer car-sharing services even prescreen users, link to their facebook profiles, and allow users to rate each other so you can rest easily knowing a bit about the person you rent your car to or from. So sit back, relax, and check out some of the peer-to-peer car-sharing services we’ve highlighted or head over to our car-sharing page for more similar services in the Bay Area.